Surf's up at Ho' Brah, a new taco joint in Bay Ridge, Brooklyn, where the food is Mexican and the margaritas are flowing. The inspiration of a group of New York's Bravest, Ho' Brah (which means "hey brother" in surfer slang) is taking the Hawaiian surfer theme to the max, from a surfboard detailing the menu outside to a huge surfer mural and surfboards on the ceiling inside. The space has a real cool vibe with its reclaimed wood, scattered tin ceiling tiles and Edison-style wall lamps. There are booths for larger groups with bulky wooden tables that have been shined up, and smaller tables for couples. Having said that, the restaurant is quite small and fills up quickly, especially on the weekends. Ho' Brah's menu also doesn't disappoint, dishing up everything you'd expect to find at a good taco joint; freshly-made tacos, burritos, empanadas and ceviche (although the menu is still a work in progress). 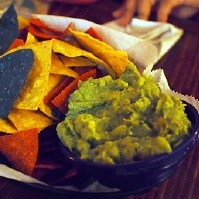 Our meal began with a bowl of guacamole that was bright and flavorful, served with a huge basket of colorful tortilla chips ($7.95). A traditional pesole soup made with shrimp is delicious and worth seeking out ($7). So are the bistec tacos ($3.95); charred beef slices stuffed into soft tortillas with a bit of shredded slaw. 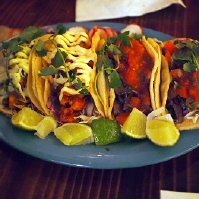 The Diablo Diego tacos made with shrimp ($3.95) offer a nice spicy kick. One of my dining companions enjoyed a smoky chorizo taco ($6.70) served with a side of rice and black beans. And don't skip out without trying a classic margarita. Served on the rocks with a nice ring of salt, they really rock at $7 apiece. Frozen margaritas in an assortment of flavors and ice cold beers are also being served. 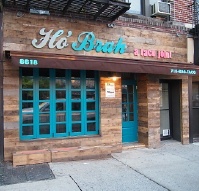 Ho' Brah is a welcome addition to the neighborhood. Aloha!